Among the lasting accomplishments of the old school renaissance has been a greater knowledge and appreciation for the books that inspired our hobby. Indeed, the phrase "Appendix N" has now become a widely used shorthand for the literary origins of RPGs. I take great pleasure in this, since it's a central contention of this blog that the collective amnesia of our hobby about where it came from has played a role in its decline and deformation. But despite the much larger number of gamers who've now read Jack Vance or Fritz Leiber or even Robert E. Howard, many continue to remain ignorant of other authors who've nevertheless had a significant influence on some of the foundational games of the hobby. 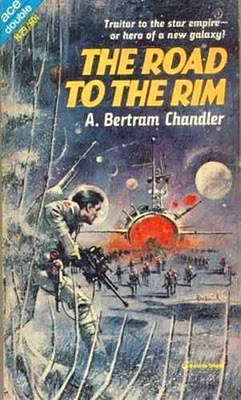 A prime example of an influential but not well known author is A. Bertram Chandler, a British-Australian writer of science fiction who wrote numerous short stories and novels during the '60s, '70s, and early '80s. Many of his works are set within the same universe, the bulk of which have as their protagonist a man named John Grimes. Grimes begins his career as a lowly ensign of the Federation Survey Service but who later becomes a free trader beyond the borders of the Federation, then a spy in the Federation's employ, and finally a commodore in the navy of the Rim Worlds Alliance, an independent coalition of planets who seek freedom outside the confines of the stifling Federation. If any of the foregoing sounds familiar to you, that's probably because you're a Traveller player. Chandler, along with E.C. Tubb -- another Brit -- is one of the great unsung inspirations for Marc Miller's RPG of science fiction adventure in the far future. "Just think about a Pact of Perpetual Amity between an elephant and a tom cat," said Baxter. "A fat an' lazy elephant. A lean, scrawny, vicious tom cat. If the elephant wanted to he could convert that cat into a fur bedside rug just by steppin' on him. But he doesn't want to. He leave the cat alone, just because the cat is useful to him. He does more than just leave him alone. He an' this feline pull out their pens from wherever they keep 'em an' sign their famous Pact. "In case you haven't worked it out for yourself, the elephant's the Federation, and the tom cat's the Duchy of Waldegren." "But why?" asked Grimes. "Why?" "Don't they teach you puppies any interstellar politics? Or are those courses reserved for the top brass? Well, Mr. Grimes, I'll tell you. There's one animal that has the elephant really worried. Believe it or not, he's scared o' mice. An' there're quite a few mice inside the Federation, mice that make the elephant nervous by their rustling an' scurryings an' their squeaky demands for full autonomy. That's where the cat comes in. By his free use of his teeth an' claws, by his very presence, he keeps the mice quiet." That pretty well describes the situation at the start of Grimes's career, before the Rim Worlds have broken away from the Federation -- and before Grimes has become fully sympathetic to their cause. However, the seeds are planted early and a lot of the action in The Road to the Rim depends on understanding Mr Baxter's metaphor of the elephant, the cat, and the mouse. Of course, the real pleasure of Chandler's stories is watching not just Grimes but the entire galaxy in which he lives evolve over time. This is not a static universe and Grimes is not a static character. I discovered Chandler fairly late, well after I'd begun playing Traveller and that's a pity. If you have a chance to read this or any of the other books in the series, it's well worth it. Not only are the stories fun space operas wit intriguing characters, they're short. The Road to the Rim is just a little over a hundred pages in length and that's fairly typical of most of the Grimes tales. Chandler has a spare but not spartan style and he's quite good at using "small" stories to share Big Ideas, which I think is one of the key features that separates a lot of the best SF from its competition. Apparently, they've been reprinted in a series of omnibus editions in the past year. So new readers can get up to speed quickly. And I'm excited to see that E.C. Tubb's Dumarest saga is being published for the Kindle. Tom, THANKS for the heads-up on Tubb on Kindle. I had looked earlier in the year and it appeared that tracking down Dumarest was going to be a chore. Thanks for the review. I wasn't familiar with him at all. Can't wait to check this writer out! It's strange. I wouldn't frame Chandler as a derivative of space opera gaming simply because his work--considering its date of publication and your description--seems derivative of earlier, more primal forms of space opera. Is this true? Or does his work represent a unique deviation from previous space opera formulas? This sort of genealogical speculation is of course guesswork unless, of course, authors are explicit (like in Appendix N!). "Fun" guesswork, though! Just curious but have you ever listened to the metal band Slough Feg? One of their best albums is all about Traveller and is appropriately titled, Traveller. I'm a fan of Chandler and appreciate your spotlight on him. My connection is rooted in one of the first alternate history novels I read in my youth; Chandler's 1984 "Kelly Country." Chandler tells an intriguing tale of the true to life 19th Century Australian highwayman Ned Kelly whose use of homemade body armor allowed him to rob banks throughout the Outback with impunity becoming a steampunk revolutionary - employing dirigibles and machine guns to overthrow British rule and establish a republic that by the mid 20th century is a corrupt hereditary dictatorship. Inspired stuff and and a compelling read. Baen books now have them in electronic format. I blundered onto them via the Encyclopaedia of science fiction (now itself coming out in a new edition) and interlibrary loan then bought some at a library sale. They are good novels in their own right. His merchant navy background lends them an authenticity lacked by many other authors. The Articles of Dragon: "And Now, The Psionicist"
Open Friday: Did You Have a Gaming Mentor? The Articles of Dragon: "The Nine Hells, Part I"
The Articles of Dragon: "Seven Swords"